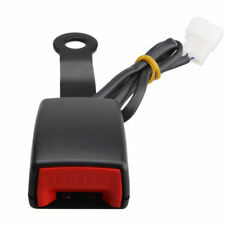 SEAT BELT ALARM BUCKLE KEY CLIP SAFETY CLASP STOP. 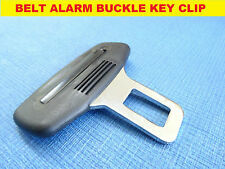 GREY SEAT BELT ALARM BUCKLE KEY CLIP. SAFETY CLASP STOP. Ending Soon. Leather Key Cover. Silicone Key Cover. Motorcycle Blank Keys. Car Stickers. ASAP,and promise 100% solve your problem. The item can be in re-saleable condition. This seat belt extension is designed to connect to your existing seatbelt. This Universal seatbelt extension fits nearly all types of buckles and receivers. Increases the size and improves comfort of your existing seat belt. 2018 New Universal Latch ISOFIX Belt Connector Car Seat Belt Interfaces Guide Bracket For Child Safety Seat On Compact SUV & Hatchback. Connectors: Latch Isofix. Universal Car Seat Seam Wedge Cup Drink Holder Seat Wedge Cup Holder Mount 1x. 2018 New Universal Latch ISOFIX Belt Connector Car Seat Belt Interfaces Guide Bracket For Child Safety Seat On Compact SUV & Hatchback. Connectors: Latch Isofix. 4M P-Type Truck Car Motor Van Door Rubber Seal Hollow Strip Weatherstrip Sealing. This seat belt extension is designed to connect to your existing seatbelt. This Universal seatbelt extension fits nearly all types of buckles and receivers. 1 x Seat Belt Extension. Increases the size and improves comfort of your existing seat belt. NEW 3 Point Retractable Car Safety Seat Belts Lap Safety Belt Seatbelts for Auto Cars With Curved Rigid Buckle. 1 x 3 Point Seat Belt Lap & Diagonal Belt. Provide added safety in driving, by being firmly secured in the seat. 1 x 3 Point Seat Belt Lap & Diagonal Belt. 3 Point Retractable Car Seat Belt Round Seat Belts for Car Curved Rigid Buckle. Provide added safety in driving, by being firmly secured in the seat. Fully adjustable hardware with quick release camlock. 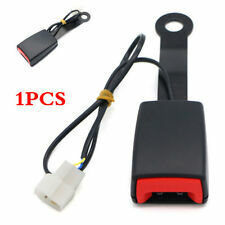 1PC seat belt buckle with Warning Cable. Note: There is a slight change in wire size due to the appearance of the batch. Universal 3 Point Front Seat Belt Buckle Kit Automatic Retractable Safety Strap. 1 x 3 Point Seat Belt Lap & Diagonal Belt. Provide added safety in driving,by being firmly secured in the seat. Fully adjustable hardware with quick release camlock. Open: 10N - 60N. Color: Black. 7/8" Camlock Auto Car Front Seat Belt Buckle Padding Socket Plug Connector with Warning Cable. 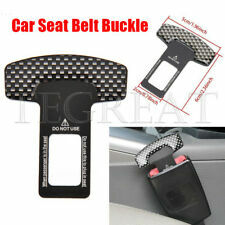 1PC seat belt buckle. Note: There is a slight change in wire size due to the appearance of the batch. We will reply you within 24- 48 hours. Funtion : Reduce the xiothes caused by seat belt effciently. 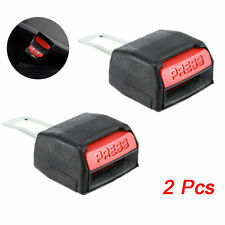 One pair car safety belt covers. Put product onto seat belt. For your safety,do not install the product while driving. Material: leather. 1 x 3 Point Seat Belt Lap & Diagonal Belt. 3 Point Retractable Car Seat Belt Round Seat Belts for Car Curved Rigid Buckle. Provide added safety in driving, by being firmly secured in the seat. We will send you a new one after receiving the defective item. 1 x 3 Point Seat Belt Lap & Diagonal Belt. Provide added safety in driving, by being firmly secured in the seat. Fully adjustable hardware with quick release camlock. Open: 10 N - 60 N. We will reply you within 24- 48 hours. Functions as normal safety belt extender and bucket alarm stopper. 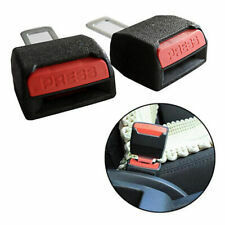 Perfect to connect to your existing seatbelt, extend the size and improve your comfort and safety. Simply connect to the existing seat belt. • The main purpose of using this item is to help eliminate the seat belt alarm when you placed heavy stuff on passenger seat while driving. • Buckle Width: 50mm. • Buckle Length: 85mm. • Easy to install, no tool required. 1 x Seat Belt Buckle. This item can stop your seat belt alert. Universal fit for almost cars, easy to install, no tool required. Size:As Picture ( Total Length: 62mm / Inside Hole: 22mm x 14mm ). Your satisfactory is our goals! 2 x Seat Belt Buckle. Thickness of the insert buckle: 2mm. This item can stop your seat belt alert. Buckle Size: 33mm x 21mm. Universal Fit Most of Cars, Trucks, SUVs, Trailers. Inside Hole: 22mm x 13mm. 1 x 3 Point Seat Belt Lap & Diagonal Belt. Provide added safety in driving, by being firmly secured in the seat. Fully adjustable hardware with quick release camlock. Length: As the Pictures Shown(Adjustable). Camlock Auto Car Front Seat Belt Buckle Socket Plug Connector with Warning Cable. 7/8" Camlock Auto Car Front Seat Belt Buckle Padding Socket Plug Connector with Warning Cable. 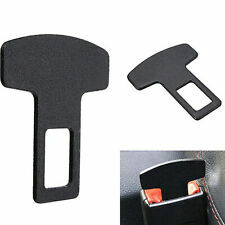 1PC seat belt buckle. Note: There is a slight change in wire size due to the appearance of the batch. 1 x Seat Belt Buckle. Thickness of the insert buckle: 2mm. This item can stop your seat belt alert. Buckle Size: 33mm x 21mm. Universal Fit Most of Cars, Trucks, SUVs, Trailers. Inside Hole: 22mm x 13mm. Luxury Crystal Glass Door Handles Kitchen Cabinet Cupboard Knobs Wardrobe Pulls. Deburring Tool Bit Chamfer Drill External Stainless Steel Remove Cutting Burr. 5x 50ml Plastic Glue Dispenser Needle Bottle for Rosin Solder Flux Paste. Universal 3 Point Adjustable Auto Vehicle Van Car Seat Belt Bolt Extension Car Seat Belt Buckle Extender Strap Safety Buckle Black. Seatbelt restraint can occupants in their seats, to prevent secondary collisions. Produced Standard: ECE R44-04 LATCH. Suitable for most of car baby safe seat, more steady and safe. Material Type: High strength polyester steel. We will reply you within 24- 48 hours. Material:Aluminium Alloy Real Carbon Fiber. 2 x Seat Belt Buckle. This item can stop your seat belt alert. Universal fit for almost cars, easy to install, no tool required. Size:As Picture ( Total Length: 62mm / Inside Hole: 22mm x 14mm ). Special Features: Latch connector bracket. This is a good solution for the back seat is without LATCH top connection point. Application2: For LATCH Hook Belt. Exclusive design! Item Type: Seat Belts & Padding. Length: 380cm. YELLOW Universal Harness Racing Front 3 Point Safety Retractable Van Car Seat Lap Belt. Safty Seat Belt 3 Bolt Point Car. Safeguard Your Life And Comfort Your Ride. 1x Safty Seat Belt. Color: Yellow. 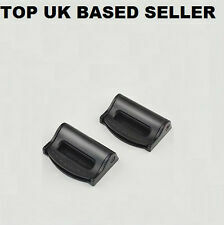 New to be used on cars,trucks,easy to install, just put them over your seat belt. Application: Universal. - Easy to install. Material: Plastic. Color: Black. Camlock Auto Car Front Seat Belt Buckle Socket Plug Connector with Warning Cable. 7/8" Camlock Auto Car Front Seat Belt Buckle Padding Socket Plug Connector with Warning Cable. Note: There is a slight change in wire size due to the appearance of the batch. This item can stop your seat belt alert. 2 x Seat Belt Buckle. Thickness of the insert buckle: 2mm. Buckle Size: 33mm x 21mm. Color: Gray. Inside Hole: 22mm x 13mm. Universal Fit Most of Cars, Trucks, SUVs, Trailers. This item can stop your seat belt alert. 1 x Seat Belt Buckle. Thickness of the insert buckle: 2mm. Buckle Size: 33mm x 21mm. Color: Gray. Inside Hole: 22mm x 13mm. Universal Fit Most of Cars, Trucks, SUVs, Trailers. The insert of the item is 2.1cm。 This Universal seatbelt extension fits nearly all types of buckles and receivers. This seat belt extension is designed to connect to your existing seatbelt. Increases the size and improves comfort of your existing seat belt.